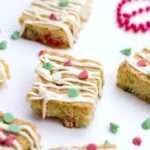 Delicious Christmas Blondies made with green, red, and white chocolate chips. Then drizzled and topped with more chocolate. So delicious and super festive, never disappoints. Fold 2/4 of the colored chocolate chips in brownie batter. Pour into coated pan and bake for 25 to 30 minutes or until it passes the toothpick test (ie. : insertion of a toothpick in the center of the brownies and it comes out clean).